Cal sophomore Ben McLachlan beat both Oregon’s Alex Rovello and UW’s Emmett Egger in two sets on court two. 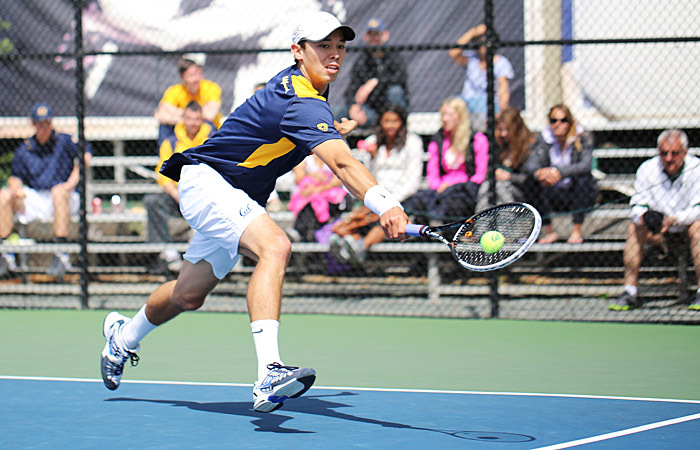 When the Cal men’s tennis team played Washington last year, the squad emerged with a disappointing 4-3 loss and aspirations for payback. This weekend, the Bears got more than just a taste of revenge — they dominated the Huskies to keep their conference record pristine. The No. 12 Bears crushed both the No. 22 Huskies and unranked Ducks in 7-0 sweeps on Friday and Saturday, respectively, at Hellman Tennis Complex. The wins were so dominant that only one opponent pushed a Cal player to a third set over the course of the weekend. The Bears began their stellar weekend by conquering Washington in quick fashion. The match was highlighted by Nick Andrews, who had been matched up against No. 14 Kyle McMurrow. While Andrews had been struggling this season against ranked opponents, on Friday he handled McMurrow with ease, delivering a 6-2, 6-2 victory. The improved team play would continue into the next day as well. The Bears performed even better against an unranked Oregon team that had just come off a similar 7-0 defeat to Stanford. This time around, the Bears offered no chances to take a match point, preventing any tiebreakers in doubles and third sets in singles. However, the dominance did not arrive immediately. The day began on a slow note as Cal’s doubles players struggled to create separation on the scoreboard. Even Andrews and Christoffer Konigsfeldt, the nation’s No. 3 doubles team, played a close game against Robin Cambier and Jeff Mullen in an 8-6 victory. Nevertheless, the Bears managed to keep their four-match streak of doubles sweeps intact. In singles play, Andrews especially could not keep up against Cambier and found himself down 0-2 early. For Cal’s senior captain, however, those would be the last consecutive points he dropped. Andrews exploded back, capturing the match point with little resistance for a 6-3, 6-1 victory. Such improvement appeared universal — four separate Cal players managed to get 6-1 sets on their opponents on Saturday. Carlos Cueto, who had lost his last five individual matches, pulled a complete turnaround by closing out Daniel Sardu in a 7-5, 6-1 decision. With the victory, the Bears have established a 4-0 conference record — the first time since 1953 — which guarantees Cal a winning Pac-12 record come postseason. More importantly, Wright believes it gives the Bears the confidence to succeed in postseason.